Day 03: Fly from Kathmandu – Tumlingtar, stay overnight at tented camp. Day 04: Trek from Tumlingtar (487m) to Gothebazaar. Day 05: Trek from Gothebazaar to Tal / Upper Phedi. Day 06: Trek from Tal / Upper Phedi to Guranse / Salpa Pokhari. Day 07: Trek from Guranse / Salpa Pokhari to Tue / Sonam. Day 08: Trek from Tue / Sonam to Cheskam. Day 09: Trek from Cheskam to Bung / Kiraule. Day 10: Trek from Bung / Kiraule to Najing. Day 11: Trek from Najing to Pangom. 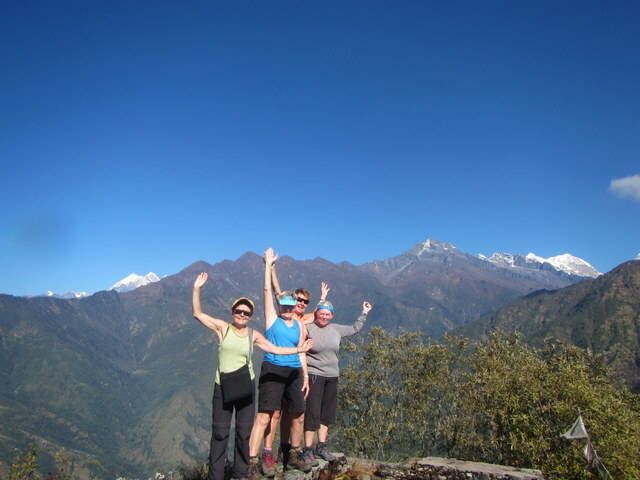 Day 12: Trek from Pangom to Lukla. Day 13: Fly from Lukla to Kathmandu. Afternoon rest or self-explore around. Day 14: Drive from Kathmandu to coffee farm in Dhading. Overnight at Country Paradise Resort. Day 15: Some activities in Dhading. Day 16: Drive back to Kathmandu and overnight hotel. Day 01: Arrive in Kathmandu, meet & transfer to hotel. Overnight. After breakfast, drive to domestic airport for your flight to Tumlingtar. Arun Valley is really a non-touristic area but we can see significant views of Mt. Everest, Makalu, and hundreds of other mountains just on your eye. The trek requires stamina and fitness to fully appreciate the beauty of the region, which provides some outstanding mountain views. Sherpa, Rai and Limbus are the main inhabitants of this region. The Arun Valley, east of Everest, leading to Makalu Base Camp is least visited by tourists like Nepal’s far west. Trek to Makalu can be cut short by taking direct flight to Tumlingtar, a small village located on a plateau. The trek from Tumlingtar at barely 390m to Makalu Base Camp at 4,800m is a long and arduous as vast range in temperatures is confronted, from steamy in the lowlands to snow storms at high altitude. Walking north up the Arun river to Sedua and Num, then crossing Barun La (4110m.) into the upper Barun khola valley for a close look at Makalu. You can put together an even wilder trek by crossing Sherpani Col and west Col into the upper Hongu valley. The highest point of this trek is Salpa Bhanjyang and also we can visit Hindu holy Lake called Salpa holy Lake (3414 m.). This is a marvelous and easy trek for trekkers who do not want to encounter a mass influx of tourists on the trail but equally enjoy beautiful scenarios of valleys, splendid views of silvery mountains. The tempting views of Arun River and valleys can be seen on the way of trekking terrain. This region is blessed with an incredible diversity of natural beauty and culture. Due to its isolation and lack of tea houses this area still receives few trekkers. Sherpa, Rai and Limbus are main habitants in this area. Walking north up the Arun river to Sedua and Num, then crossing Barun La (4110m) into the upper Barun Khola valley for a close look at Makalu (8463m). You can put together even wilder trek by crossing Sherpani Col and west Col into the upper Hongu valley. The second part of the trek is very difficult and almost impossible without previous experience. You will follow the upstream trail of Arun river towards north through the sub-tropical forest around Baluwabesi, crossing Brahman, Chettri and Rai villages. Stay overnight at tented camp. You will pass through terrace land with rice paddies, Citrus fruits, Banana groves etc. sparsely populated by Rai and Sherpa people. You also can see Nepali paper production from Lokta. Stay overnight at tented camp. You will leave the forest with deciduous trees and start with the forest of Rhododendron trees. You can know about local people, their culture and visit the holy lakes. Stay overnight at tented camp. You will cross the Salpa La and continue on in a forest of fir and rhododendron. Stay overnight at tented camp. You will visit Rai and Limbu community. These people are mostly chosen for Gorkha soldiers and they are popular for their bravery. Stay overnight at tented camp. You can visit Kiraule monastery and Sherpa people. Stay overnight at tented camp. Near Kiraule, above Bung there is an important trail junction headed towards Panch Pokhari and the route to the Mera La from Lukla. To the Northwest a large path leads over Sipki La and crosses the Inkhu Khola. Stay overnight at tented camp. Today again you will climb to the Satu La and finally join main Everest Highway at Kharikhola. Stay overnight at tented camp. You will descend towards Lukla after passing Surke, The day would be last day of your trek. Overnight in Lukla. After breakfast, drive from Kathmandu to Dhading which is approx. 3 and half hours’ drive to Country Paradise Resort.